Security personnel carry out rescue and relief works at the site of suicide bomb attack at Lathepora Awantipora in Pulwama district of south Kashmir. 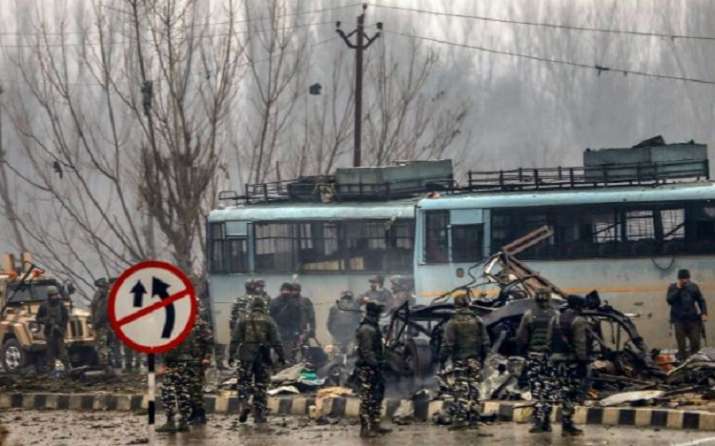 At least 37 jawans of the Central Reserve Police Force (CRPF) were martyred when a bus they were travelling in was ripped through in a fidayeen attack (suicide attack) in Jammu and Kashmir's Pulwama district on Thursday. 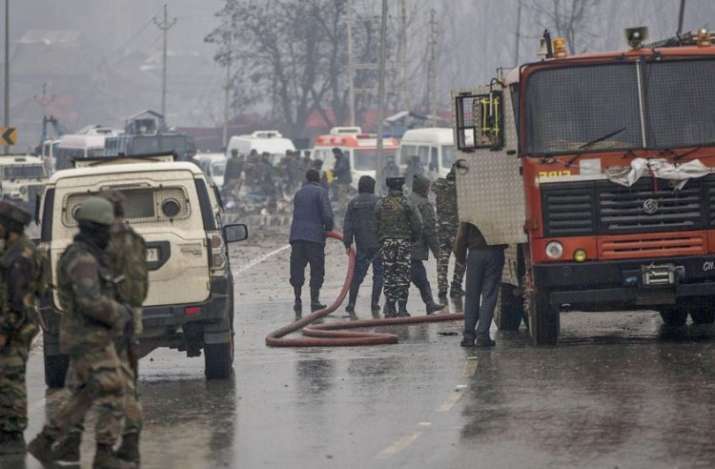 Gunshots were also heard following the blast which took place on the Srinagar-Jammu highway in Awantipora area of the district. Casualties are likely to go up, news agency PTI reported quoting officials. This is the worst terror strike Jammu and Kashmir has witnessed in decades. Terror group Jaish-e-Mohammed has claimed responsibility for the dastardly attack, officials said. The powerful explosion, which reduced the bus to a mangled heap of iron, was heard many kilometres away. Several people were injured in the blast. According to reports, Jaish terrorist identified as Adil Ahmed Dar rammed his explosives-laden SUV into one of the buses of the CRPF convoy. As per reports, nearly 2,500 jawans were part of the over 70-vehicle CRPF contingent which was moving from Jammu to Srinagar. The convoy started from Jammu around 3.30 am and was supposed to reach Srinagar before sunset. 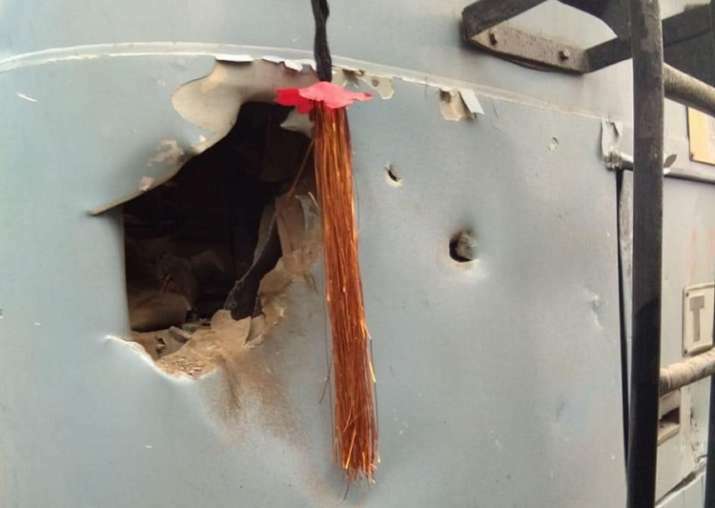 The vehicle which rammed into the CRPF bus was laden with nearly 200 kg explosives, initial investigations have revealed. "Senior officers are at the spot, the investigation is underway. Injured being taken care of. There were 2500 personnel in the convoy," CRPF DG RR Bhatnagar said. The number of CRPF personnel travelling back to the Valley was high as there was no movement on the highway for the last two to three days because of bad weather and other administrative reasons. Usually, about 1,000 personnel are part of a convoy. A road opening party was deployed and the convoy had armoured counter-terror vehicles, officials said. The bus that was the focus of the attack belongs to the 76th battalion of the force. Meanwhile, Home Minister Rajnath Singh called CRPF DG RR Bhatnagar to take stock of the situation following the deadly terror attack. Rajnath Singh also spoke to Jammu and Kashmir Governor Satyapal Malik. Rajnath also met Special DIB, IB director and NSA Ajit Doval.The Home Minister is likely to visit Srinagar Friday after attending a Cabinet Committee on Security (CCS) meeting. "The attack was carried out by Pakistan backed Jaish-e-Mohammed. I assure the people of the country that a strong reply will be given. The country pays tribute to the brave jawans who were martyred," Rajnath Singh said. 10 CRPF jawans have been injured in the attack. In the attack on the Uri military base in September 2016, JeM militants killed 18 Army jawans and injured dozens of others.